How do I create an isolated Python 3.4 environment with Boto 3 with an Amazon EC2 instance that's running Amazon Linux using virtualenv? How do I create an isolated Python 3.4 environment with Boto 3 on an Amazon Elastic Compute Cloud (Amazon EC2) instance that's running Amazon Linux using virtualenv? 1. Install Python 3.4 for Amazon Linux. 2. Use virtualenv to create the Python environment. 3. Activate the environment and install Boto 3. Note: These instructions are for EC2 instances running Amazon Linux. 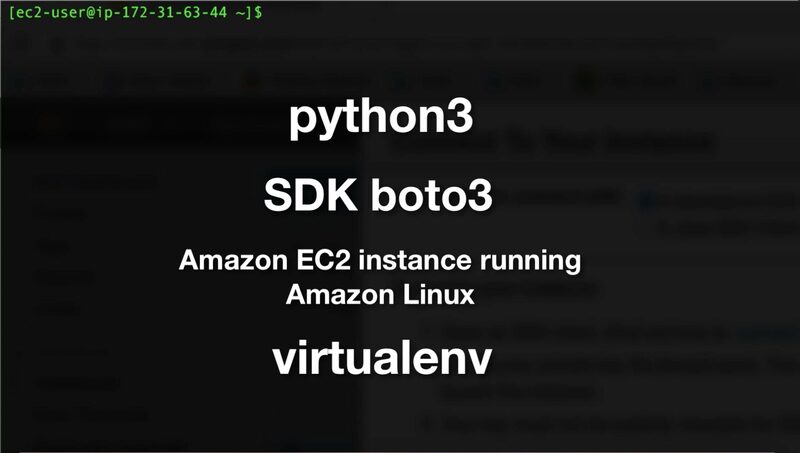 If you're running Amazon Linux 2, see How do I create an isolated Python 3 environment with Boto 3 with an Amazon EC2 instance that's running Amazon Linux 2 using virtualenv? 1. Connect to your EC2 Linux instance using SSH. For more information, see Connecting to Your Linux Instance Using SSH. 2. Perform a yum install update. 3. Launch Python, and then use the version command to find what Python versions are installed. 4. Install Python 3.4, if it's not already installed. 5. Use the which command to confirm that the install was successful. 1. Create a directory to hold your virtualenv environments, and then use the cd command to make it your current directory. In the following example, the environments are stored in the venv directory, under the ec2-user directory. 2. Use the virtualenv command to create the python34 environment. 1. Attach an IAM role to the EC2 instance with the proper permission policies so that Boto 3 can interact with the AWS APIs. For other authentication methods, see the Boto 3 documentation. 2. Activate the environment by using the source command on the activate file in the bin directory, which is under your project directory. 3. Use the which command to verify that you are now referencing the new environment. 4. Use the pip command to install Boto 3 from within the python34 environment. 5. Run Python using the python executable. 6. Import the Boto 3 SDK, and then validate that it works. Be sure that you have the permission policies configured from step 1. The following example lists all the Amazon Simple Storage Service (Amazon S3) buckets in your account. 7. Deactivate the python34 environment. 8. Run the which command to confirm that you are using the default environment. 9. To activate the python34 environment automatically when you log in, add the activate command to your .bashrc file. 10. Exit from the session. 11. Re-connect to your EC2 instance, and then use the which command to verify that the default python version for your user is python34.